In the mid 1930's it was realized that the Luftwaffe needed a light fighter that could also serve as an advanced fighter trainer. 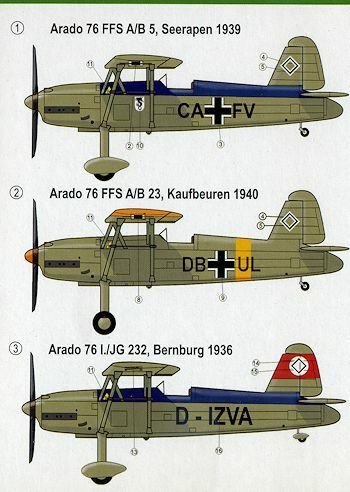 A tender was placed and both Focke-Wulf and Arado responded with prototypes. Both aircraft met the goals required however the Focke-Wulf FW-56 'Stosser' was chosen over the Arado entry. 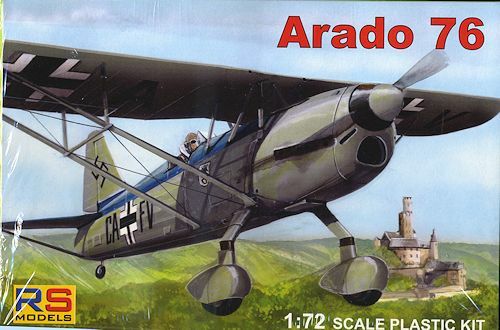 Despite this, low scale production of the Arado was undertaken in case there were issues with the FW-56, which there were not. The Ar-76 was briefly initial equipment for a few fighter units until their standard mount was available. Most of these planes spent their entire careers in various flying schools. Often times the wheel spats were removed when the weather made the landing fields muddy. You have to give RS Models credit for producing this kit and they have done several boxings of it as a result. 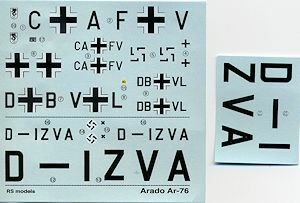 The single sprue is in a medium tan plastic and the kit also comes with a photo etch fret. 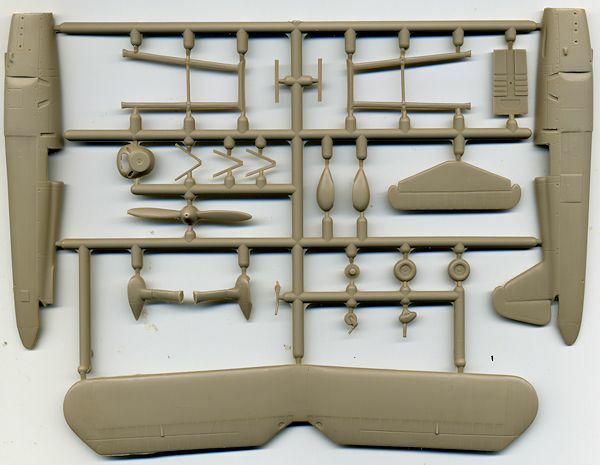 This latter items is mostly for detail bits and includes a cockpit instrument panel, rudder pedals, seat harness, an interior floor and rear bulkhead, as well as the small struts that were placed about halfway out the main struts to help keep the parasol wing firmly in place. In many ways the design of this one was just like the FW-56. 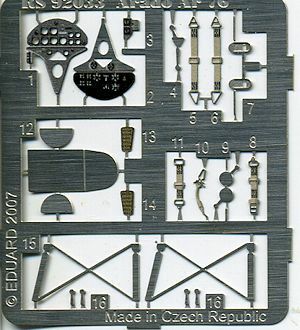 There really is not all that much to the kit as you can see from the sprue image. Wheels are separate and you have the opt ion of a spatted or clear tail wheel. One does have quite a few small V struts to hold up the wing on the fuselage and the attachment points for the main wings struts are well defined. A pair of clear injected windscreens are provided. Instructions are on a single folded sheet of paper that, like the decal sheet, is exactly the same width as the zip bag it comes in. You cannot get it out without folding it and removing the decal sheet was not an easy task either. All of the markings options in this boxing are overall RLM 02. The first option has a dark blue upper deck and was assigned to FFS A/B 5 in 1939. The next one has no wheel spats and yellow upper and lower wings with a yellow fuselage band. it was assinged to FF A/B 23. The final version is one from 1936 also with a blue upper fuselage section but with a red and white tail band and civilian registration as required at the time. It was with I./JG 232. Though the decal sheet has the red fin band on both sides, this one 'might' have had the red, white, black bands on the other side. Decals are nicely printed and should provide no issues. I admit that this one might not be for everyone, However, it is a rather unusual aircraft that one almost never sees kitted. It is also a fairly simple kit that would be perfect for an introduction into the world of short run kits. Kit instructions and what little is out there on the 'net. Thanks to me for spotting a bargain when I see it.